It's easy to enhance the rich and creamy taste of your coffee with these Hood shelf-stable aseptic creamer cups! These convenient .4 oz. portion control cups make the perfect addition to any self-serve coffee station in your convenience store, lobby, reception area, hotel breakfast bar, or employee break room. Compared to bulk canisters of creamer, each pre-portioned cup contains just the right amount of creamer for a steaming cup of coffee or tea. Your patrons can order their hot beverages for take-out and grab one of these portion cups to take with them on the go! Even if you're buying them as an individual customer , and not for a store, these are a great option. I can keep better track of calories by using 1-2 of these, rather than pouring a random amount into my morning coffee. Not to mention the convenience of not worrying about a big spill if you drop it, haha. We began ordering this product at first mostly because of the reasonable cost. Now, however, our employees ask us to order it because they prefer it over the brand we were using. Needless to say, it's a favorite among employees. I love these creamer cups. Each little cup contains almost half an ounce. I absolutely recommend it. It makes your coffee taste so much better. I purchase Crown coffee and Hood creamer and my customers like it. I have never had a complaint and my food costs are much lower, especially since I joined "plus". A great creamer for our bakery and the shelf stable aspect of them is perfect. A great portion size and the quality is so good. In a small church where people like to have their coffee, having a shelf stable creamer is a game changer. no need to be buying creamer every week because it goes bad when not in use. Or more accurately it goes bad because someone left them out! Not with these! This product has a rich flavor. This Hood Half & Half has the best flavor is the world. I love to put this product in my coffee all the time. These are great. We use these in our store and it makes it so much easier for the customers. I highly recommend these to those looking for creamer! I was happy to not only be able to offer half & half to our customers for their coffee but was happy that it was affordable through webstaurantstore.com and that it arrived without any being broken open! Will definitely re-order through webstaurantstore.com! A nice value box of shelf-stable aseptic creamer that is perfect for any coffee cart or stand. The creamer is great for adding a splash to coffee and come in the perfect little containers. We use this for when customers order multiple to-go coffees for meetings or things like that, where there are multiple people who would take their Coffee different ways. The creamers are a good price and sold in a convenient quantity (so you don’t have to keep thousands in your inventory). This Half and Half .4 oz shelf-stable aseptic creamer is delicious. It is a great price for getting 360 in a case. It makes any kind of coffee taste delicious. Each pack is so well sealed and last a very long time. The Hood .4 ounce shelf-stable aseptic creamer is great for our coffee cart. The creamer do no have to be refrigerated which is perfect and they are great quality. Perfect for coffee! Love these creamers! We use them for specific events at our coffee shop and also give them out with Joes to Go. Very handy to have on hand. As a cafeteria, It's a extra expenses for creamer, sugar, stirrer etc. 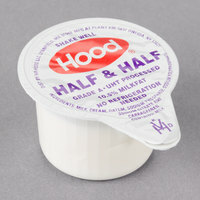 I ordered this substitute mini moos half n half for little less money for extra stuff. There has little tight expire date as other review said. For what I got, less than 2 months advance. Our customers love these handy creamers. We offer them with our to go carafes of coffee and it's less messy than a whole carton of cream. These shelf stable creamers are perfect for our customers who order a box of coffee to go for a meeting or other event. We are able to provide them with all the condiments they need without worrying about cream spoilage. This product worked perfectly for what I needed it for- a coffee bar at my wedding. I was a little worried that they would be negatively affected by the hot weather during shipping, but when they arrived, they were just fine. The packaging does say not to store them above 70 degrees, but temperatures were definitely above that during shipping and they were fine, so your mileage may vary. Very pleased with these creamers. They have never arrived damaged, and they ship in a timely manner. I work in a restaurant, and they are alot cheaper here then where I get the rest of my food. They don't need to be refrigerated, and the expiration dates are usually a few month from when you order, so you can always stock up a bit. Great product. We use these to offer cream to customers at an outdoor farmers market, where we do not have refrigeration. We keep them in a cooler with a few ice packs, and they are very convenient. Great price for half and half creamer. We pay more for this when we order from our distributor and we get less in a case. We will be ordering this again! A great shelf stable creamer that does not have to be refrigerated so it makes it easier to store. The creamer works great and is great for our coffee station. The shipping was very quick, and no damage to the creamer inside. Well worth it for the price, also get the other flavors for variety. These creamers are perfect for our coffee tables at events! The packaging is durable and they do not break easily like we have found with other creamers. These individual creamers make an attractive coffee station display. They do not take any refrigeration space because they are aseptic and therefore are shelf stable until the date. Growing up in New England, I have always known Hood to be a great milk company. I love these little shelf stable creamers. They have a nice taste and good packaging. We have bought similar creamers from a local store with no problems. However, we thought we would save some money and try these. We are a coffee shop and use a lot of cream every day. These were nearly expired when we got them. About 1/2 of them were leaking and already spoiled. We had to throw the rest out because we can't tell which ones are rancid or not. Will not buy again. Thank you for your feedback, Eric! We are sorry your products arrived damaged or expired. A Customer Solutions Representative will be in contact with you about this shortly! My company has turned over a new leaf with this creamer!!! WE were always using dried creamer, but there is no comparison!! This tastes great and the fact that it is shelf stable, makes it a real winner!! I have noticed everyone is drinking more coffee!! These were perfect for a high-volume event where it's hard to keep a creamer carafe full. They are a great value and decent shelf life too! This is a product that I was very skeptical about. I had not ever heard of this brand, but the customers seem to love it so great buy!! Hood Half & Half arrived quickly and well packaged. It tasted exactly as it should. Containers are easy to open and pour. Helped make a great Mudslide! We only serve coffee on certain days of the week so these creamers are perfect for our business. The best thing is that they are shelf stable also! These creamers are completely equivalent to other brand creamers on the market. The price of these creamers are phenomenal. We use a lot of the individual creamers for catering and to go orders so they are great buy for us! Great product! Didn't want to have to carry milk or cream to offer coffee, this is a great solution for a shelf stable product. Tastes great too. We wanted some condiments for our coffee business. While the containers of creamer are cheaper, to have an opened container that needs to be refrigerated or go bad over time, using these packets works better for our smaller business. The price for a name brand packet has been really great for us. Some prefer the liquid creamers to the powdered ones. There is no waste with these since you don't have to fill a container for each table. It is also a plus that they are shelf stable and then last without taking up refrigerator space. Great to have on hand just in case people need them. I do like how they are shelf stable so you don't have to worry about keeping things cold. The expiration date was only 5 weeks after we received the item. We expected to get 10 or so weeks out of them. They started going bad about 4 weeks after we got them, so we had to throw away almost have the case. We appreciate your review, Bimal! If you have any concerns with the product that you have purchased, please contact our Customer Solutions team. I have a Lot of good things to say about these Half&Half I keep the We are Coffee Drinkers and they are Very Good Flavor. And a Great Story Ran out of Milk and had these problem solved and no added sugar. Not happy with this product. I thought that it was shelf stable, which it is, but it does have an expiration date. The expiration was only about a month and the fact that there are so many in a case, I had to throw out half the box. Wouldn't buy this again. We are always running low on creamer it seems so it was nice to see that webstaurant sold them. Much better price per creamer than any grocery store. These individually packaged creamers are so convenient. It is so nice that they don't need to be refrigerated. One less thing to worry about keeping fresh. We purchased these little creamers for our customers to use with their coffee and everyone seems to really enjoy them. We have to re stock them every day! It is the perfect size for our coffee station too. DO NOT BUY THESE!!! I ordered these for my coffee shop and within a week I threw the entire box away. Over half of the cream containers leaked and made a huge mess all over the rest of them. Even for the price, these are not worth it! Spend more money and get a good brand, you will be glad you did! Thank you for the review, Jennifer! We're sorry these were defective. A Customer Solutions Representative will contact you about this shortly. This is a large box of a lot of creamer. It really does get the job done though. Has not gone bad on the shelf, tastes pretty close to real cream and none of the little guys broke in transit. We thought these creamers would have a longer expiration date on them, but WS customer service was quick to help. A great product for the cost and amount you get, but ensure you are able to use all 360 fairly quickly. They are perfect for what they are. It's nice to have something that is portioned out for people. But the down side is the waste that comes from all the empty containers. Hood is a name that is very well known and trusted in Vermont. People expect to see this company on our take. Always fresh and seldom see any broken during shipping. Nice product! I like the fact that it does not need to be refrigerated. It is much better than providing a pitcher of half and half or cream. I find that, at most, people use one or two of them, so a couple of boxes can last for months. Great quality for a low price! Great for our coffee table, keeps customers happy and it doesn't cost as much as other brands. Great deal. We loved this product! Perfect for a family business and great for home as well. We love this site and plan on using it permanently! Thanks so much for your products! I love this product! Its a clean, easy way to leave creamer out for my customers. They last a very long time and the taste is comparable to fresh creamer. And since they are shelf stable they don't take up precious room in my small fridge! I wanted an unsweetened creamer and that's exactly what this is. They do have an expiration date, and very close to the date they did start to go bad, so I had to throw them all away. I did not use them up fast enough. So if you use them fast enough they are great. If not, they are too costly. I ended up switching to a non-dairy creamer as the shelf life is longer. This is a great product. We use these in our concession trailer to put out with coffee. It tastes great and it never goes bad. Customers enjoy it. Great product. All of my customers are very happy with it. If you're only going thru a small amount of creamer a day, don't order in large quantities as the expiration dates may not be very far out. We have been using this brand for quite a while without any complaints or problems. They don't leak, they aren't hard to open, they taste normal, they are shelf stable for a long time, and there's no reason to switch to another brand. These are the best for the price and quality. My customers love the fact this is a brand name that is highly regarded and used in our area. They taste great! Perfect for the service station in my coffee shop, I like the individual creamers instead of putting cream out, and these are perfect for that! The creamers themselves were fine, but almost all of them burst during transit. Webstaurant Store replaced them but the same thing happened again. The are a great deal but not when they arrive unusable. Thank you for your review! We are sorry to hear that these creamers did not survive through shipment. A Customer Solutions Representative will contact you soon to credit the defective creamer to your account.. This is a great product, it taste good and the best part that works for my coffee shop is that I can have them outside and they don't have to be refrigerated. Very reasonably priced product which our staff can't live without since we started providing it to them. Same as the name brand product at a better price. These creamers taste fine but customers at our coffee shop are often skeptical. Probably this is due to all the unfamiliar ingredients listed on the top of the package. I have since switched to coffee-mate creamers and customers haven't complained since. Best thing about this product is it can be kept on the shelf so saves space for other items. Taste is good and very similar to the name brand creamers. Perfect item for a coffee bar that doesn't have refrigeration or a lot of space. Good shelf life for this product. Fits easily in most coffee organizers. This is a perfect item for coffee customers because they can take them and leave. It is very nice because they dont need to be kept cool, so they dont expire! which saves lots of money and unwanted waste. Wow, this is a huge box of creamers that I use in my office for clients with my Kurig coffee machine. It lasts a long time and clients love it. Our store is all about convenience to keep labor costs low and having creamers that don't quickly go bad is great. We don't sell a lot of coffee so this is a perfect product. So glad to have found these creamers - I had to go to a membership club for these - their expirations were too soon and they were costly. These taste good, are a good price and have good expire dates.